A fast & robust iPod backup is a must for any iPod fans, you never know when your iPod would collapse unexpectedly and it's really impressed unfortunate to lose those precious things. So keep in mind, backup your iPod videos, music, photos & books to your Mac once you got something amazing. 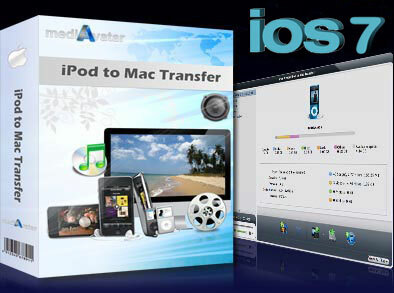 And mediAvatar iPod to Mac Transfer is mainly designed to help you do these, rescuing you from unexpected loss. Fast sync music, videos, photos, ebooks from your iPod to Mac or iTunes library, transfer these files from Mac to your iPod without iTunes, and also share your favorite music, videos, ebooks, photos and ringtones with another iPod or iPhone. iPhone users can enjoy all the same features as well. And it's also possible to transfer playlist among iPods and iPhones. Owning the most ideal solution to manage, rip, copy, sync iPod/iPhone on personal computers, mediAvatar iPod Transfer simplifies your iPod management greatly. Download mediAvatar iPod to Mac Transfer for FREE now, and start to manage, sync, transfer and backup your iPod in the fastes and safest way! Your robust iPod manager on Mac, mediAvatar iPod to Mac Transfer helps you backup your iPod music, movies, music videos, photos, and ebooks to your Mac or iTunes. No fear of losing your iPod files again! Backing up iPhone files is also available. Faster than iTunes, this Mac iPod transfer lets you drag and drop your music, movies, videos, ebooks and photos on your Mac to iPod, and also to iPhone, as your reliable Apple iTunes alternative. Now you can easily transfer apps between Mac and iPod, more than this, you can even manage documents for some apps. Connect many iPods and iPhones to this iPod to Mac transfer, then transfer and share videos, music, photos, ebooks and ringtones in between on Mac. All iPod/iPhone models (iPod nano, iPod nano 7, iPod mini, iPod shuffle, iPod classic, iPod touch 1/2/3/4/5, iPhone, iPhone 3G, iPhone 3GS, iPhone 4, iPhone 4S, CDMA iPhone 4, iPhone 5, iPhone 5s, iPhone 5c and iPad Air) can be accepted in this Mac iPod transfer, which can manage all these devices at the same time and transfer media files & playlists in between. All device information about your iPod or iPhone, such as device image, model, capacity, version number, serial number and format, will be recognized and shown by mediAvatar iPod to Mac Transfer. Owning many computers but don't want to install this iPod transfer on all your Mac computers? Or want to share your favorite videos or music on the computer of your friends? Installing this iPod backup Mac software on your iPod could help you solve this problem. Transfer and share iPod files on any Mac computers now, much easier and handier than iTunes! Create, edit, delete iPod/iPhone playlists to your liking, and transfer playlists among multiple iPods and iPhones on Mac. Quickly browse your iPod media library by genre, artist and album using Filter, or search iPod files as quickly and easily as iTunes by entering keywords. Check your music, movies, ebooks or photos in thumbnails or list mode, and add illustrations for your iPod media files in the thumbnails view. Transfer movies, music, ebooks and photos from Mac to iPod, iPod to Mac and iPod to iTunes at incredibly fast speed. This iPod to Mac transfer offers a media player for playing iPod files at your ease. For Mac users to convert videos, audios to iPod; transfer music, movies, photos, books between iPod and Mac; download online videos to iPod.